Snorkeling provides thrilling views of coral formations and fish. Both novice and expert snorkelers comment on the beauty of the pristine marine environment. Visitors enter the sallie port at the end of the moat bridge to explore Fort Jefferson. Within its walls is a small visitor center and gift shop. Stow your everyday life and set sail for Dry Tortugas National Park! 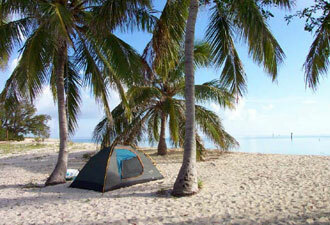 Located 70 miles west of Key West, this park is considered one of the most remote in the country. So remote in fact, the only way to get here is by boat or by seaplane. Come for a day or come to camp for the experience of a lifetime! Dry Tortugas National Park in the Gulf of Mexico, a scant 100 miles north of Cuba, is at a confluence of ocean currents, maritime history, sea life, and birds. The shallow waters and seven small islands of this 100-square-mile park are a haven and nursery for an abundance of life. The park sits at the westernmost reach of the Florida Reef, the third largest reef in the world, and offers some of the most pristine marine environments in the United States. Begin your experience of the Dry Tortugas at our downtown visitor center, The Florida Keys Eco-Discovery Center. This free, interagency facility can provide you with all the information you'll need for your trip and the scoop on the many activities and creatures you'll see. Can't make it out to the park? Stop by to see some of the sights you would otherwise miss. 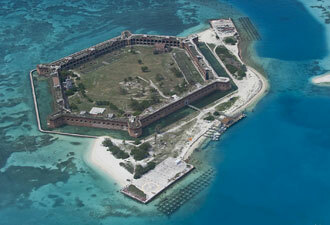 The centerpiece of Dry Tortugas National Park is magnificent Fort Jefferson. At 10 acres in size, this amazing engineering feat is the third-largest seacoast fortification the United States ever constructed. Its massive brown and red masonry walls rise in stark contrast to the calm turquoise seas and white sand it was built to defend. Visitors to the park are immediately confronted with a major decision of what activity to do first. Many begin their day with a guided tour of Fort Jefferson. These programs are led by ferry staff or rangers and provide an overview of the area's history and of Fort Jefferson specifically. 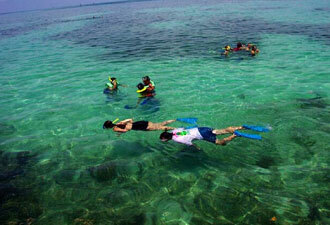 One of the main attractions is the fabulous snorkeling available right off of the beach. The shallow waters around Fort Jefferson are home to amazingly vibrant hard and soft coral and many species of reef fish. Not to be out-performed by their fishy friends, the birds that migrate through the area are astounding! Magnificent frigate birds, sooty terns, brown noddies, and masked boobies are just a few of the perennial favorites. And, of course, there are the turtles. Visitors regularly see turtles on their seaplane or boat voyage to the park. The most common species are the loggerhead and green, though hawksbill and leatherback are found in the area too. So how does one reach this impressive location? If you're fortunate enough to have your own vessel, you have a fantastic opportunity to come see the park and stay for up to 14 days. Most visitors arrive via the two approved daily commercial operators, the Yankee Freedom ferry boat or the seaplanes of Key West Seaplane Adventures. Either option offers a thrilling journey to a memorable locale. If this adventure appeals to you, we look forward to seeing you soon! Be sure to pack your sense of adventure, check the weather, plan your visit, and set your sights for the western horizon!